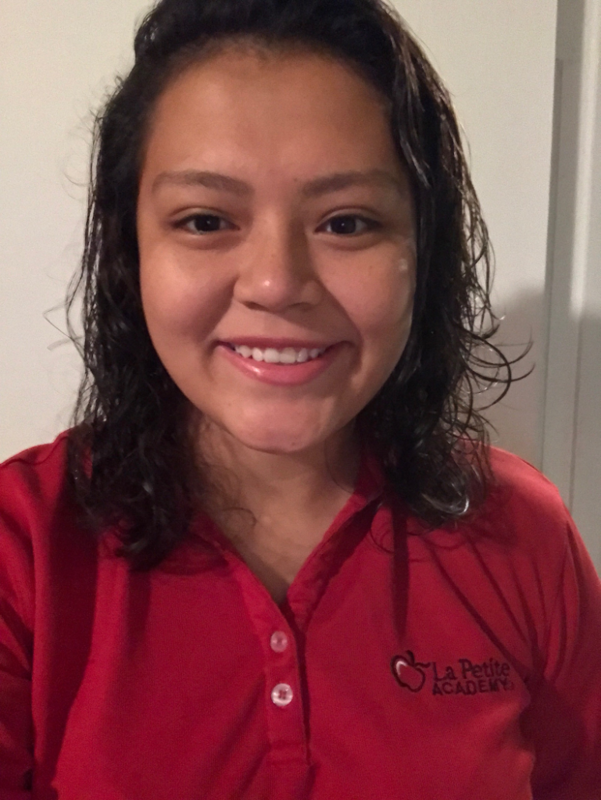 Get to know Ms. Lorena, lead toddler teacher at La Petite Academy in Dumfries, VA! She’s currently attending college where she’s studying elementary education and has experience working with little ones through her church. Read on to learn more about this awesome member of our team! Can you take us through an example of what your typical day looks like? In the morning they come in and we sing songs. And when they are all here, we sit down for circle time where we read a book. For example, we read Big Red Barn on Monday. We’ll go through the book, talk about animal sounds and their colors. With that book specifically, it’s from daytime to nighttime, so they learn about that. After circle time, we go outside and play for 30 minutes. When we get back inside I give them water, we sit down and sing our songs like our “ABCs” or “Five Little Monkeys” and sit and talk. We do our numbers and sometimes we draw. Then lunch comes. We all sit down at the table and then after lunch, they go down for nap. They get up, we have a snack, and when it’s around 3:30, we go outside again. We come back, have water, and sit down and draw. They leave by about that time. What is the benefit to starting kids in education programs at a young age? When they’re at that age, they’re learning something different every day. I think it’s good for them, especially to learn manners at that age. How do you ensure strong communication between yourself and your students’ parents? I love using our mobile app! I send them pictures of what they’re doing every day. Then, when they come and pick them up I tell them how their child did, if they had a good day and what they did. What were your favorite subjects from when you were in school? Social studies. I also loved history. Those are my favorites. What’s your favorite book to read to your students? To Market to Market by Anne Miranda. I love that book because we learn a “mess mess” is a no no” and when I would say “messy, messy,” they would say “no, no!” We incorporate the book into our daily tasks. Can you share a memorable moment you’ve had here at La Petite Academy? Why did you decide to take a job in early education?